Toppings can always be your choice - we had: Cheddar and blue cheese, sour cream, chives from the garden, smoked salmon, caviar (just the Kroger kind), bacon, salsa, and pepper jelly. Always think leftovers and grocery salad bar! Line a rimmed baking sheet with foil and put in the potatoes. 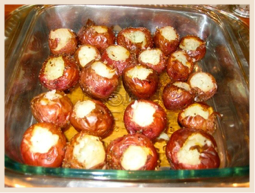 Coat potatoes with a couple of Tbsp of olive oil and a generous sprinkle of seasoning. Roll around to cover. Bake for about 30 minutes until soft. Serve potatoes and toppings and enjoy the compliments!